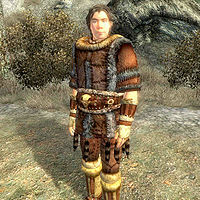 Torbern is a Nord acrobat and the master trainer in Acrobatics. He can be found at Aerin's Camp high in the Jerall Mountains. Torbern sleeps from 8am to noon. At noon he will wake up and have a two-hour lunch and will offer training if the Fighter's Stronghold plugin is enabled. After he finishes his lunch he will wander around the camp offering training until 8pm and will have a four-hour dinner. He will then sit on his stool and offer training until 8am. He is equipped with a set of fur armor: a cuirass, gauntlets, greaves, and boots. He will greet you with "Hello there. Welcome to Aerin's Camp." If you have started the training quest for Acrobatics, he will tell you that there is no 'Aerin' living in the camp: "You came all this way for training from Aerin? You must be really disappointed that she's not here. Well, I haven't ever seen her, so I guess you're out of luck there. But, if you want... I could train you. I'm pretty skilled myself. And I could always use the money." Torbern was supposed to tell you a bit about Aerin, but the related 'camp' topic is not available and the dialogue cannot be heard in-game: "Yeah, it's her camp. I don't know where she is, though. For that matter, I don't know who she is either... No one was here, so I thought I'd settle in." (listen).